A: It's easier for me to share links, pictures and videos. The reality is, most people that contact me found me via an article I've written or a reply I've written on this forum. The thing is, instead of figuring out that the whole reason they are contacting me is because they found me via an article or answer I wrote on the forum that they to should bring their question to the forum because not only will that help them.... but it will help a future "them". If I answer everything in a private e-mail or other touch point, no one would find and contact me. It's a cycle or pattern that repeats as long as everything is shared in the public domain. The above is kind of wordy but re-read it slowly and it will make sense. Taking a chance you’ll reply. I purchased the Flex 3401 and supples from AG after following you for a year. This is my first project on my 2017 Black F150 to correct the paint by removing spider webbing and wash scratch. Used LC Hydro-Tech pad with Menz 3500 on one panel and LC green CCS pad with Menz 3500 on another panel. Used Wolfgang Finishing Glaze with CCS grey pad to try and correct the holograms. It didn’t work. I stripped the wax again on the CCS panel and realized the holograms were gone. Applied the wax again (pinnacle sovereign) and they come back. I stripped the wax and compounds with a 50/50 IPA 91%. I used too strong an IPA dilution (saturated sections of the panel and wiped immediately) and I don’t know if this will harm paint. Can it dull it down to cause this? I wiped it off immediately. I am having difficulty troubleshooting because they disappeared after I stripped down the wax. At first I thought they were organic because of direct sunlight, but they don’t look right. Appreciate any feedback. I don’t want to move forward until I know what’s wrong. I downloaded your pictures, resized them to a normal viewing size and then uploaded them to the AGO gallery so I could insert them below before making comments or offering suggestions. If you've followed me for a year you may have seen that I answer questions on the forum. That's how most people find me. People don't find me via other people's e-mails so I answer questions where people are - hope that makes sense. What you see here are the SCRATCHES put into the paint by the mis-use of a ROTARY BUFFER. The word hologram swirls or more specifically, hologram scratches are a specific type of scratch pattern unique to the rotary buffer, no other tool and not a FLEX 3401 or any orbital polisher. Orbital polishers can leave micro-marring, but not holograms. As for what I do see in this picture, these look like finger marks from rubbing your hand over the paint, probably with a microriber towel. That or they're clouds overhead. 1: Always do a Test Spot. Some guys only test the compound and polish, but a full Test Spot goes all the way through to the LSP. 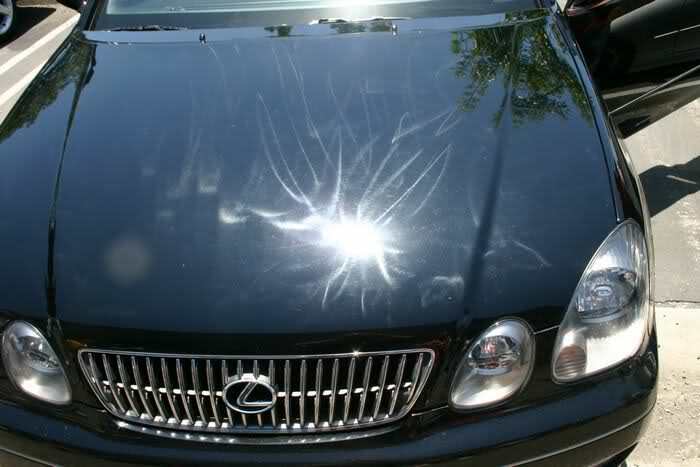 Make sure you can make one spot look like you hope and dream about before buffing out the entire vehicle. 2: Quick wiping car paint down with IPA. I never do this, it's just plain nasty. The ONLY reason I ever wrote an article on how to do it was because back when I wrote the article we had an "Expert" that has been banned for years now, telling everyone to strip their paint with IPA but he never gave any specifics for how to dilute the various options on the market. All I did was ask some real chemist what the dilutions should be and share it. I NEVER said I use the procedure or endorce it, I was just trying to make-up for the expert's horrible advice. 3: My guess is your machine polishing steps are leaving the paint perfect. Try applying the wax, allow it to dry, then wipe it off carefully and then wait for a few hours before doing any more wiping. The "protection ingredietns" need to set-up. If you keep wiping them you're disrupting them and basically wiping them off. 5: Consider attending one of my classes, there's the 3-day here, coming up in a few weeks. There's the 2-day roadshow classes, this weekend I'm in Colorado, then in Chicago, then Atlanta, then we start over in 2019. Nothing beats hands-on training. Also - 60% of the people that attend any of my classes are doing so to simply learn how to work on their own cars. They are NOT professional detailers working for profit. October 19th & 20th at Dr. Beasley's in Chicago, Illinois <-- Coming up quick! Hope that helps and feel encouraged to join our forum, this is where I answer questions. Email is okay, but the forum is powerful. Mike is the man. He has posted in the forum before about pinnacle souverän. Mike recommended letting it haze before wiping off, even though it's a wipe on wipe off product. I've tired it both ways. It worked well either way for me. Letting it haze first made an easy product even easier. The man knows what he is talking about. Now I do the whole vehicle then wipe it off. While I don't know what you'd call them, I think I've experienced what the person asking the question is trying to describe. When applying some waxes or sealants I've found I didn't quite buff them out completely. This led to very faint smeary marks which somewhat resembel faint and widespread versions of the buffer holligrams. Often they only appeared in certain types of lighting. When I did find them, I'd simply dampen a MF towel with some QD spray and lightly buff the area and the marks would disapear. The root cause in my situation normally was the result of uneven or over application of the LSP which led to incomplete removal. Hi Mike: I sent the email and I appreciate the immediate response and direction. Your instruction to let the wax set up combined with member Desertnate's suggestion resolved my issue. I likely over applied the wax. I used a QD spray and they wiped away. I took it to a local detailer before reaching out to you. He said the compound caused it and they needed to be buffed out. The pictures do not demonstrate what I saw - they were 3 dimensional and resembled the buffer holograms I see on vehicles all the time. The forum just saved me hours of unnecessary work ! I appologize to everyone for the horrible spelling errors in my post...multi-tasking combined with an in-browser spell checker which doesn't seem to be working is a bad combination. If you don't completely remove the oils(residue) from a wax OR polish, they could easily resemble holograms. -Not to mention the IPA wipe downs. Insanity. Now I am wondering how much clear is left and negative impacts :-)? By dougsrt in forum Ask Mike Phillips your detailing questions!